How much does it cost to travel to Queenstown? How much money will you need in Queenstown? 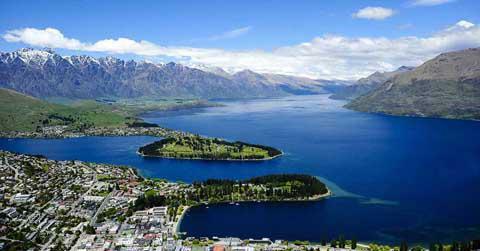 NZ$133 ($89) is the average daily price for traveling in Queenstown. The average price of food for one day is NZ$45 ($30). The average price of a hotel for a couple is NZ$143 ($96). Additional pricing is in the table below. These average travel prices have been collected from other travelers to help you plan your own travel budget. How much money do I need for Queenstown? Queenstown is a popular tourist destination on New Zealand's South Island. It is beautifully surrounded by the Southern Alps and sits on the banks of Lake Wakatipu. Across the lake you will find a stunning view of the Remarkables, a dramatic mountain range. The town itself is quite touristy, but prices still remain reasonable. There are options for all travel budgets, whether you're a backpacker hoping to save a few dollars or a family looking for some luxury accommodation. Despite its natural and tranquil setting, Queenstown is actually very much a party town, particularly during the peak seasons. Don't be surprised to find people out enjoying themselves until the early hours of the morning. If you're not into the party scene and are hoping to get a decent night's sleep, consider staying a little outside of town. About an hour outside of Queenstown you'll find Wanaka, which is a much smaller and peaceful town without the party scene. Queenstown's climate is oceanic, influenced by the town's location on the shore of Lake Wakatipu as well as its relatively moderate altitude and the surrounding mountains. The summers are warm with temperatures that may climb to 30 degrees Celsius. The winters are cold with frequent snowfall, but there is no permanent snow cover. Most people come to Queenstown for the spectacular views of the mountains. The scenery in the area is excellent. You'll find one of the best views of the area from the top of Bob's Peak. This peak can be accessed by the Skyline Gondola and there are views of Coronet Peak, the Remarkables mountain range, and the Cecil and Walter Peaks across Lake Wakatipu. There is also a beautiful, scenic drive to Glenorchy. It takes about fifty minutes traveling north along Lake Wakatipu. The Gibbston Valley wine area is also just a twenty minute drive from town along the Kawarau Gorge. Queenstown has a few neighborhoods that each have their own atmosphere. The central business district is the best area to stay if you hope to take advantage of the town's nightlife. There are more than fifty bars in the area. If you want a slightly quieter experience, there are several surrounding neighborhoods that make a quiet base but offer easy access to the center of town. The Glenorchy Road area and the Kingston Road area have great views and a natural setting with high end lodges, bed and breakfasts, and vacation rentals. The Gibbston Valley area has a variety of accommodation options near many of the vineyards. Arrowtown is the historic precinct with much of the area's history and culture. Queenstown offers some excellent adventure sports opportunities. These include skiing, snowboarding, bungyjumping, jet boats and horseback riding among other things. There are several private companies that offer trips out on the lake. This is a great way to enjoy the area's beauty. Several companies also organize scenic flights. Helicopters can take you around the area and offer views that can't be beat. If you're hoping to relax a little, there are several good wine tasting opportunities as well as the Body Sanctum Day Spa in the area. The Central Oteago wine region produces cool climate wines that are of great quality. You really won't be at a shortage of things to do if you have a couple days in Queenstown. You'll find every type of restaurant in Queenstown, from fast food take away that is open all night long, to fine dining seafood restaurants where you can enjoy a nice, well prepared meal. The nicer restaurants in town almost always require a reservation, particularly during peak season when they can fill up quickly. Many of the wineries in the area are also open for lunch. Queenstown's town center is small and easy to walk around. Parking within the city center can be a challenge. There is a bus service called Connectabus. There are three routes, with the most helpful to tourists being services 10/11. This route runs every half hour between the airport, the Remarkables Park shopping center, and alternating routes that continue on to Arrowtown. There are also two trips a day to Wanaka. If you're hoping to get out on the lake then you can pick up a tour at Queenstown Wharf. There's also now a water taxi service which is less of a tour but will take you out on the water.